What does the keyphrase in slug assessment do? The keyphrase in slug assessment checks if and how you have used your focus keyphrase in your URL. Your article or page should live on an easy to remember, focused and SEO-friendly URL. 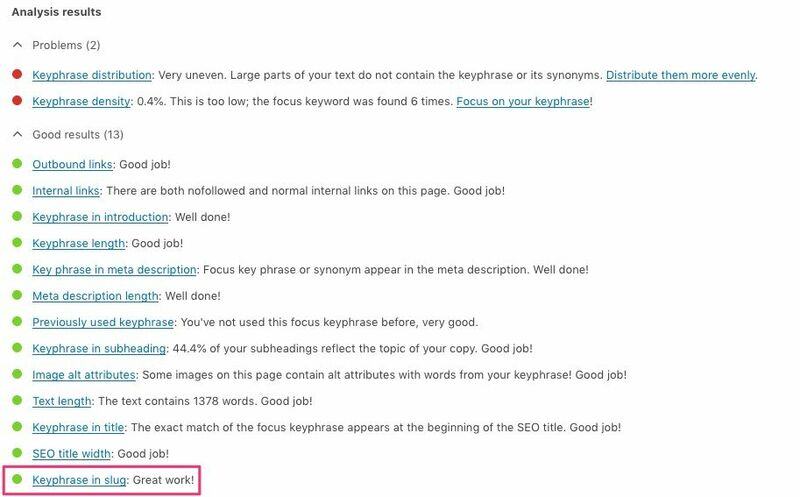 To improve the slug part of your URL, Yoast SEO checks how you’ve fitted in your main focus keyphrase and makes suggestions to improve it. Why are URLs important for SEO? Your content deserves a memorable URL. An SEO-friendly URL is one that is focused and not too long. Try to keep your URLs as simple and short as possible. A good URL makes it easy for visitors and search engines to figure out what the page is about. It should make you want to click that URL. If possible, your URL should not contain gibberish or an excessive amount of numbers. It is a very good idea to use your focus keyphrase for that post in its URL, but try to make it look natural. Yoast SEO will guide you in this. Do you want to improve your URLs? While Yoast SEO checks if you have used your focus keyphrase in your URL, there’s more you can do to create perfect URLs. It all starts by defining your permalink structure in your CMS and determining how you want to organize your URLs. Do you want to include a category or is it enough to use the name of the post? The more parts you add to a URL, the more complex and hard to understand it gets. Focus is key. This also goes for your site structure. Try to use only lowercase letters, because, in some cases, you can create duplicate content by mixing these two. Also, try to limit or avoid the use of dynamic URL parameters — these make it harder to read an URL and might cause potential visitors to skip your URL entirely. And, as a final friendly reminder: don’t spam your focus keyphrase in your URL.